Big thanks to the Charlotte Checkers hockey for hosting their annual JDRF day. It’s always a fun time and it’s also the official kickoff to walk season. The JDRF walks are major fundraisers for the chapters and the family teams raise most of the money. I’m the family team chair this year, so Benny and I were asked to speak. Announcer Jason Shaya tapes a “Community Spotlight” segment that airs on the big screen during the hockey game. I tried to prep Benny, but he wanted to wing it. Then we found out it was only 30 seconds long, so he decided I’d do the talking. Also have to say a big thank you to NASCAR driver Ryan Reed. Ryan was diagnosed with type 1 in 2011 and was told he’d never race again. Instead, he decided he’d never see that doctor again. With a new medical team, Ryan had a very successful first year on the ARCA circuit in 2012. He’s got a big announcement coming up next week about his racing future. Can’t wait! Ryan brought his car, tricked out with a simulator for the kids. 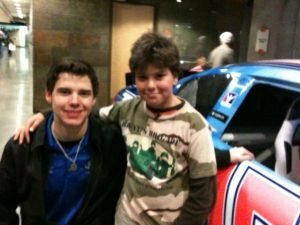 He also very patiently answered all of Benny’s questions about how to become a race car driver. I’m trying to get Benny to see that wisdom of a front office job at Charlotte Motor Speedway. Wish me luck.